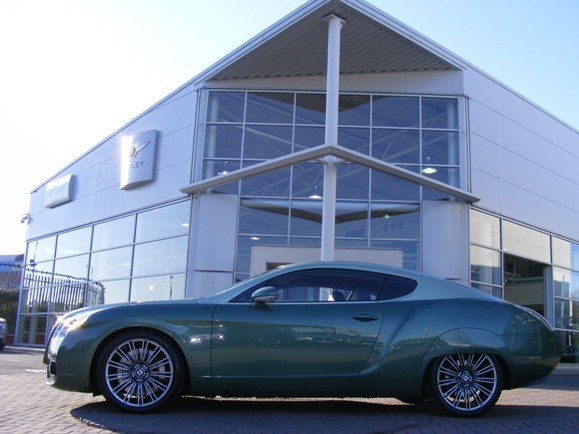 A bespoke Bentley GT Speed which has undergone a ‘Zagato’ conversion making it one of the rarest cars in the world with just nine of the specially-commissioned vehicles in existence, has gone on display at JCT600 Leodis Court Bentley on Gelderd Road in Leeds. The car has an unusual history having begun life as a Bentley GT Speed Coupe, 2008 with 9000 miles, covered in St James Red, which was bought from the JCT600 dealership in 2011. The purchaser subsequently used a specialist design and engineering firm in Coventry to convert it into a green £800,000 supercar, one of just nine designed by Italian studio Zagato. We sold the car following a telephone enquiry from a collector and it seemed a fairly normal sale of a beautiful, but standard bright red Bentley GT. It’s amazing to see the same car coming home to Leeds two years later as a green one-off Bentley Zagato, one of the rarest supercars in the world. This really is a very special car and one of just two Bentley Zagato models still in the UK. We’ll have it on display at Leodis Court until 20 March and urge any enthusiasts to come along and see it for themselves and it’s likely to be the only chance you get! The supercar was built by the Envisage Group in Coventry and is owned by retired businessman Jack Henley. JCT600, which has its head office in Bradford, is a family business which operates 42 dealerships throughout Yorkshire, Derbyshire, Lincolnshire and the North East, selling 21 of the world’s most respected brands. Located in Lower Wortley, JCT600 Brooklands offers a range of new and used Aston Martins as well as full servicing facilities and specialist parts.